Searching for affordable childcare in Waterford, MI can be trying. Finding a daycare center that fits your budget, as well as provides superior support and education for your child is a must. The love a parent has for their child will not allow them to leave their child with just anyone. Even the first time you leave them with a person you love and trust can be gut-wrenching. It’s a natural parent-child bond, that we understand and want to help ease you through. 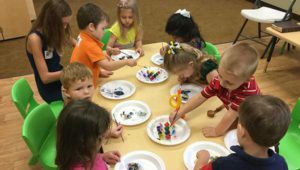 Located in Waterford, Michigan, Paradigm Child Care & Enrichment Center provides excellent infant daycare, toddler care, preschool services, and well as enrichment programs for children. We will help guide your child through the learning process. During this young age, ensuring that they receive the care and attention that they need. Give your child an early advantage by enrolling them at Paradigm Child Care & Enrichment Center. With early 3 and 4-year-old learning, you give your child the advantage they need to succeed in school. Our facilities are highly maintained, clean, and safe for your child to grow, and develop friendships with other children. One thing in particular that we pride ourselves in is our educational based philosophy. What does this mean? Well, other daycare centers in Michigan are just that, a daycare. You drop your child off, they run, play, socialize, and may even have a book read to them. At Paradigm Child Care we incorporate learning into every activity that your child participates in, and they may not even know they are learning! From arts and crafts, growing seeds, music, reading, to learn how to drink out of a regular cup, we want to teach your child everything they can learn in a fun and friendly environment, while at the same time providing affordable child care in Michigan. Our facility accepts FIA assistance for those who are eligible, every child deserves the same opportunity to learn and grown regardless of a family’s income. Also, we will do our best to help your child become a member of the Paradigm family! Finally, for more information or to enroll your child in our Waterford or Canton location, contact us and we will guide you every step of the way!